The Supreme Court on Wednesday ruled that placing reliance on Parliamentary Standing Committee Reports by Courts does not constitute a breach of Parliamentary privilege. The judgment was delivered by a five-Judge Constitution Bench comprising Chief Justice Dipak Misra and Justices AK Sikri, AM Khanwilkar, DY Chandrachud, and Ashok Bhushan. The Court was hearing Public Interest Litigations, one of which was filed by one Ms. Kalpana Mehta, who had challenged usage of two vaccines- Gardasil and Cervarix- on tribal women in Andhra Pradesh and Gujarat for treatment of cervical cancer. She had alleged that the vaccines, marketed in India by MSD Pharmaceuticals Pvt. Ltd. and GlaxoSmithKline Ltd., were hazardous, and were being administered to such women without making them aware of the possible consequences of the same. Initially, the matter was being heard by a two-Judge Bench. During the course of the hearing, the Petitioners had drawn the Court's attention to a report of the Parliamentary Standing Committee. The Committee had, in its 81st report in 2014, concluded that a PATH/Government of AP/Government of Gujarat HPV vaccine experiment constituted "a serious breach of medical ethics (and)… a clear-cut violation of the human rights of these girl children and adolescents." "Whether in a litigation filed before this Court either under Article 32 or Article 136 of the Constitution of India, the Court can refer to and place reliance upon the report of the Parliamentary Standing Committee? Whether such a Report can be looked at for the purpose of reference and, if so, can there be restrictions for the purpose of reference regard being had to the concept of parliamentary privilege and the delicate balance between the constitutional institutions that Articles 105, 121 and 122 of the Constitution conceive?" 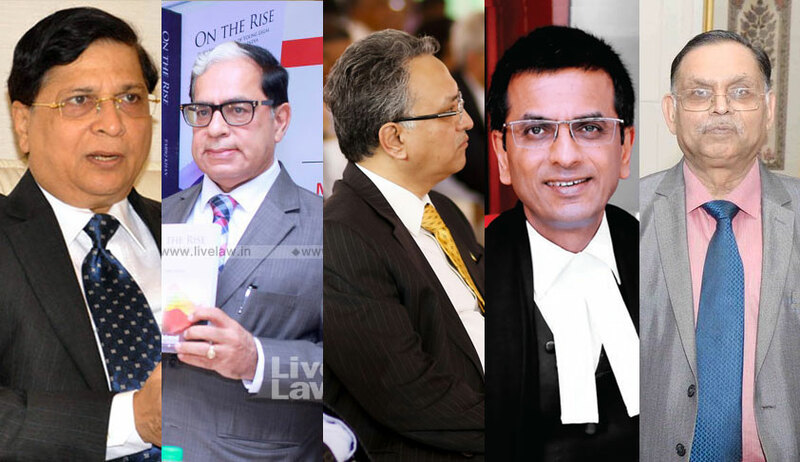 Justice Misra began by discussing the concepts of the supremacy of the Constitution and constitutional limitation, separation of powers, the ambit and scope of judicial review, judicial restraint, the progressive method adopted by the Court while interpreting fundamental rights and the expansive conception of such inherent rights. He also deliberated upon the interpretation of other constitutional provisions that really do not touch the area of fundamental rights but are fundamental for constitutional governance. He then proceeded to acknowledge that the Court was currently concerned with the interpretation of Articles 122 and 105 of the Constitution of India. He noted that reports of parliamentary committees have various facets, namely, statement of fact made to the committee, statement of policy made to the committee, statements of fact made by Members of Parliament in Parliament and inference drawn from facts and findings of fact and law. Therefore, he opined that it needed to be ascertained as to which of these aspects of the reports can be placed reliance upon. "(i) Parliamentary Standing Committee report can be taken aid of for the purpose of interpretation of a statutory provision wherever it is so necessary and also it can be taken note of as existence of a historical fact. (ii) Judicial notice can be taken of the Parliamentary Standing Committee report under Section 57(4) of the Evidence Act and it is admissible under Section 74 of the said Act. (iii) In a litigation filed either under Article 32 or Article 136 of the Constitution of India, this Court can take on record the report of the Parliamentary Standing Committee. However, the report cannot be impinged or challenged in a court of law. (iv) Where the fact is contentious, the petitioner can always collect the facts from many a source and produce such facts by way of affidavits, and the Court can render its verdict by way of independent adjudication. (v) The Parliamentary Standing Committee report being in the public domain can invite fair comments and criticism from the citizens as in such a situation, the citizens do not really comment upon any member of the Parliament to invite the hazard of violation of parliamentary privilege." After an analysis of various concepts, including separation of powers and judicial review, Justice Chandrachud asserted that the modern doctrine of separation of powers has moved away from a 'one organ – one function' approach, to "a more realistic perspective which recognizes the complementarily in the work which is performed by institutions of governance". Noting that it is ultimately for the Court in each case to determine the relevance of a report to the case at hand and the extent to which reliance can be placed upon it, he further explained, "If the function of judicial review in facilitating the realization of socio-economic rights is construed in the context of the modern notion of separation of powers, there is no real conflict between the independence of the judicial process and its reliance on published reports of Parliamentary Committees." (iv) When a matter before the court assumes a contentious character, a finding of fact by the court must be premised on the evidence adduced in the judicial proceeding..."
"(i) According to sub-clause (2) of Article 105 of Constitution of India no Member of Parliament can be held liable to anything said by him in Parliament or in any committee. The reports submitted by Members of Parliament is also fully covered by protection extended under sub-clause (2) of Article 105 of the Constitution of India. (ii) The publication of the reports not being only permitted, but also are being encouraged by the Parliament. The general public are keenly interested in knowing about the parliamentary proceedings including parliamentary reports which are steps towards the governance of the country. The right to know about the reports only arises when they have been published for use of the public in general. (iii) Section 54(4) of the Indian Evidence Act, 1872 makes it clear that the course of proceedings of Parliament and the Legislature, established under any law are facts of which judicial notice shall be taken by the Court. (iv) Parliament has already adopted a report of "privilege committee", that for those documents which are public documents within the meaning of Indian Evidence Act, there is no requirement of any permission of Speaker of Lok Sabha for producing such documents as evidence in Court. (v) That mere fact that document is admissible in evidence whether a public or private document does not lead to draw any presumption that the contents of the documents are also true and correct. (vi) When a party relies on any fact stated in the Parliamentary Committee Report as the matter of noticing an event or history no exception can be taken on such reliance of the report. However, no party can be allowed to 'question' or 'impeach' report of Parliamentary Committee. The Parliamentary privilege, that it shall not be impeached or questioned outside the Parliament shall equally apply both to a party who files claim in the court and other who objects it. Any observation in the report or interference of the Committee cannot be held to be binding between the parties. The parties are at liberty to lead evidence independently to prove their stand in a court of law. (vii) Both the Parties have not disputed that Parliamentary Reports can be used for the purposes of legislative history of a Stature as well as for considering the statement made by a minister. When there is not breach of privilege in considering the Parliamentary materials and reports of the Committee by the Court for the above two purposes, we fail to see any valid reason for not accepting the submission of the petitioner that Courts are not debarred from accepting the Parliamentary materials and reports, on record, before it, provided the Court does not proceed to permit the parties to question and impeach the reports. (viii) The Constitution does not envisage supremacy of any of the three organs of the State. But, functioning of all the three organs in controlled by the Constitution. Wherever, interaction and deliberations among the three organs have been envisaged, a delicate balance and mutual respect are contemplated. All the three organs have to strive to achieve the constitutional goal set out for 'We the People'. Mutual harmony and respect have to be maintained by all the three organs to serve the Constitution under which we all live. (ix) We are of the view that fair comments on report of the Parliamentary Committee are fully protected under the rights guaranteed under Article 19(1)(a). However, the comments when turns into personal attack on the individual member of Parliament or House or made in vulgar or abusive language tarnishing the image of member or House, the said comments amount to contempt of the House and breach of privilege. (x) The function of adjudicating rights of the parties has been entrusted to the constituted courts as per Constitutional Scheme, which adjudication has to be made after observing the procedural safeguards which include right to be heard and right to produce evidence. Parliament, however, is not vested with any adjudicatory jurisdiction which belong to judicature under the Constitutional scheme. (xi) Admissibility of a Parliamentary Committee Report in evidence does not mean that facts stated in the Report stand proved. When issues of facts come before a Court of law for adjudication, the Court is to decide the issues on the basis of evidence and materials brought before it."